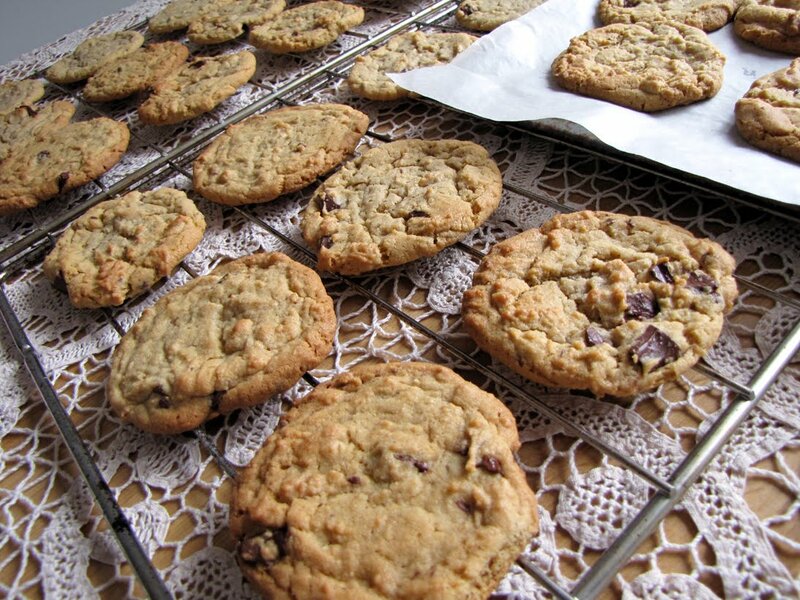 American cookies are a big weakness of mine - soft and chewy, fresh from the oven... *drool*. Having the ability to re-create them in my own kitchen is a danger indeed if this first attempt at these peanut butter cookies from the Hummingbird Bakery Cookbook is anything to go by. They are so more-ish! 2. Put the butter and sugars in a freestanding electric mixer with a paddle attachment (or use a handheld electric whisk) and cream until light and fluffy. Add the eggs one at a time, mixing well and scraping an unmixed ingredients from the side of the bowl with a rubber spatula after each addition. Turn the mixer down to slow speed and beat in the vanilla extract and peanut butter. 3. Add the flour, bicarbonate of soda and salt and mix well until a smooth dough is formed. Stir in the chocolate until evenly dispersed. 4. Arrange 6 equal amounts of cookie dough on each prepared baking tray. 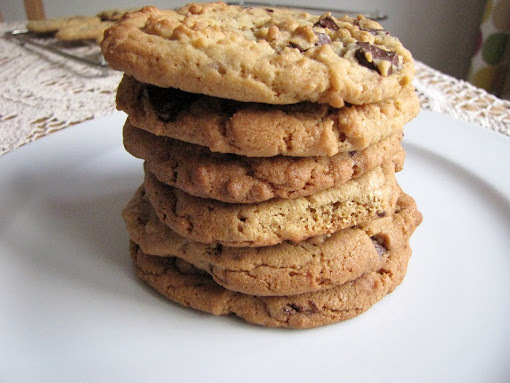 Make sure that the cookies are spaced apart to allow for spreading while baking. Bake in the preheated oven for about 10 minutes, or until golden brown around the edges and quite flat. Leave the cookies to cool slightly on the trays before turning out onto a wire cooling rack to cool completely. 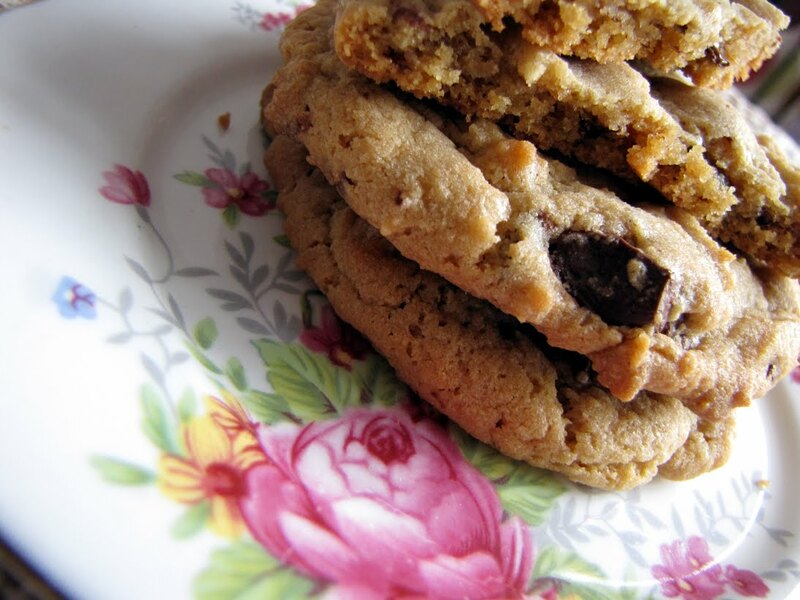 The cookies should be soft and chewy. 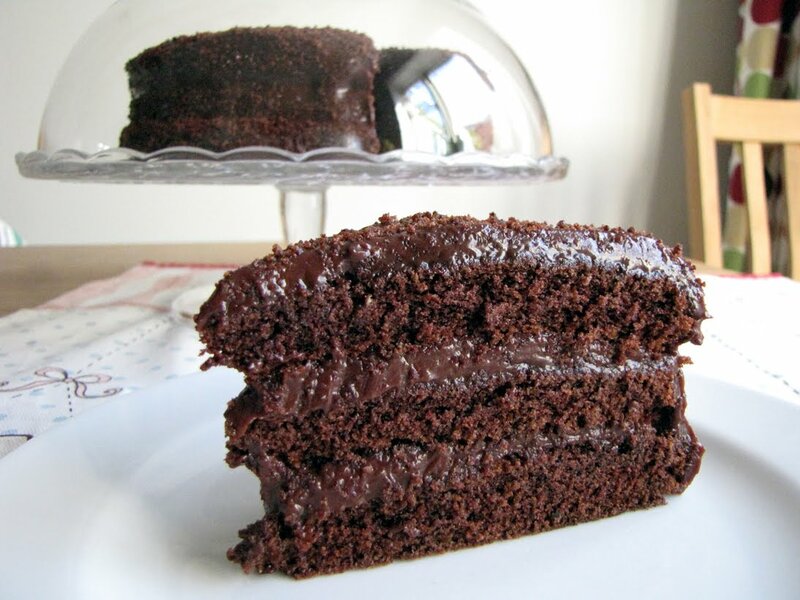 The surprising thing about this cake is that it does not call for any proper chocolate as one of its ingredients - all of it's chocolatey-ness comes from cocoa powder. Not only that, but instead of butter frosting, the cake is covered in a sort of set chocolate custard, made from water, sugar, cornflour and cocoa powder. It certainly doesn't look or taste any less rich for it and goes down nicely with a big dollop of greek yoghurt. 2. Put the butter and sugar in a freestanding electric mixer with a paddle attachment (or a handheld electric whisk) and cream until light and fluffy. Add the eggs one at a time, mixing well and scraping any unmixed ingredients from the side of the bowl with a rubber spatula after each addition. Turn the mixer down to slow speed and beat in the vanilla extract, cocoa powder, baking powder, bicarbonate of soda and salt until well mixed. Add half the flour, then all the milk, and finish with the remaining flour. Mix well until everything is well combined. 3. Pour the mixture into the prepared cake tins and smooth over with a palette knife. Bake in the preheated oven for 20 mins. Leave the cakes to cool slightly in the tins before turning out onto a wire cooling rack to cool completely. 4. For the chocolate custard: Put the sugar, golden syrup, cocoa powder and 600ml of water into a large saucepan and bring to the boil over medium heat, whisking occasionally. 5. Mix in the cornflour with 120ml of water, then whisk into the cocoa mixture in the saucepan. Bring back to boil , whisking constantly. Cook until very thick, about 10 minutes. Remove from heat and stir in the butter and vanilla extract. Pour the custard into a bowl, cover with clingfilm and chill until very firm. 6. When the cakes are cold, using a serrated knife, slice a thin layer off one of the cakes. Put this layer into a food processor and process to make fine crumbs. 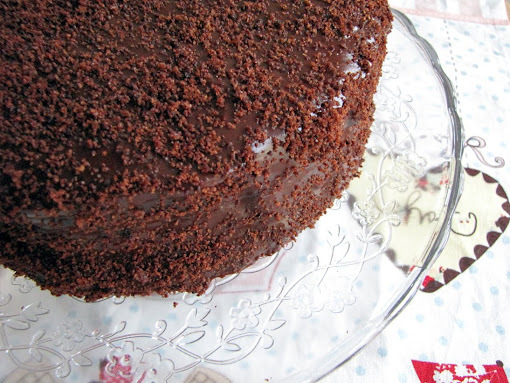 Put one cake on a cake stand and spread about one-quarter of the chocolate custard over it with a palette knife. Place a second cake on top and spread another quarter of the custard over it. Top with the last cake and spread the remaining custard over the top and sides. Cover with the cake crumbs and chill for about 2 hours. Usually, for me, a meal without meat is not a meal. But conscious of my growing bump (yes, I am pregnant! ), I'm trying to consume as much veg as possible. 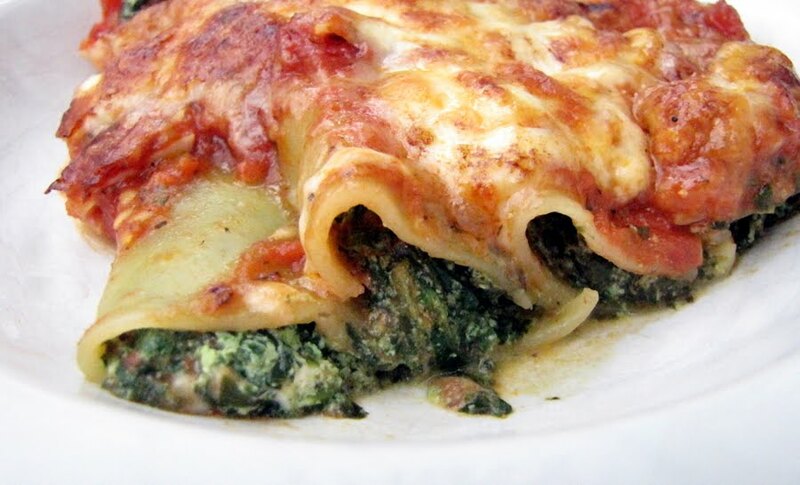 Spinach seems like one of those vegetables that is pure goodness - after all, it did wonders for Popeye. So, tonight my goal was to consume as much spinach as possible. This recipe from the BBC Good Food site calls for goat's cheese, which is a no-no while pregnant, so I substituted that for a mixture of ricotta and feta.